The aroma of fire and metal is in the air in the jewelry lab at the Shenkar College of Engineering and Design. Based in Ramat Gan, Israel, the lab brings the art of jewelry-making into the 21st century. Here, traditional craftsmanship methods meet digital fabrication and 3D printing to bring student creations to life. Formlabs Design Lead Yoav Roches teaches students how to 3D print in Castable Resin on a Form 2. It was in this unique setting that Formlabs organized a jewelry workshop for the Shenkar students. 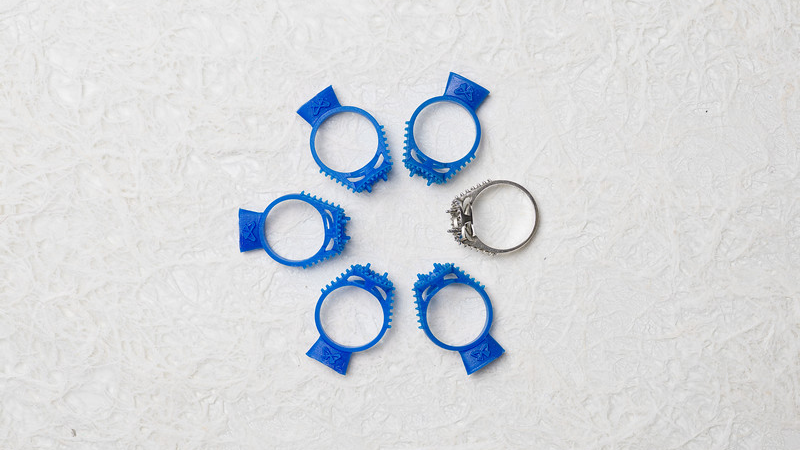 Yoav Roches, our Design Lead and a former Shenkar teacher, partnered up with university professors to teach a three-day workshop about jewelry design, 3D printing, and investment casting. After printing on the Form 2 is complete, a student lifts Castable Resin jewelry pieces off of the build platform. The lab has a Form 2 3D printer along with various industrial 3D printers. Eden Offer, the lab’s 3D printing manager, explains, “Our department consists of over 100 students, so every week, we have a lot of printing to do.” During this workshop, students learned how to 3D print directly on the Form 2, giving them hands-on experience in professional 3D printing for jewelers. Students build casting trees so that they can cast many 3D printed pieces at once. The students used Castable Resin to capture the intricate details and smooth surfaces of their designs. They attached the 3D printed pieces to casting trees so that they could cast many pieces at once. After the investment casting process, the students polished their jewelry designs by hand. A student adds the final touches to a ring by polishing it to a mirror finish.